Thai Son Group Co. Ltd is an economic unit under the Ministry of National Defence (MND), doing business in a number of areas, both domestically and internationally. The Group consists of 20 subunits, companies and joint ventures with more than 5,000 cadres and workers. Thoroughly understanding its assigned tasks, the Group identifies the improvement of production capacity and business efficiency in combination with the implementation of mass mobilization as their key missions, making contribution to the consolidation of national defence potential and social-economic development. In 2016, the Group’s revenue was 4,300 billion VND (115.8% against its plan), budgeted 159 billion VND, and the average income was 9 million VND per person per month. It was a firm foundation for the Group to effectively conduct mass mobilization and fulfil its function as “an army for work and an army for produce” in the new situation. In order to successfully conduct mass mobilization, the Group’s Party Committee and the Board of Directors have guided the creation of a close bond with the people, building firm local areas, thus making favorable conditions for sustainable production and business, and firmly maintaining its logo of “Thai Son Group Company Limited share and harmonize its benefits with the benefits of the community”. While doing so, the Group has focused on thoroughly grasping directives, resolutions, and guidance of its superior commands on mass mobilization. The Group has always closely attached its characteristics and tasks to its annual resolution, plan, and mass mobilization regulations. In implementation, its cadres and party members have promoted their exemplary roles and responsibilities, combining mass mobilization with the acceleration of studying and following Ho Chi Minh’s ideology, ethics, and style. Due to its specific characteristics of operating on various fields with dispersing cadres, the Group’s Party Committee and Board of Directors have paid due attention to raising awareness of cadres, staff, and workers towards mass mobilization, particularly of the cadres working on construction sites and in representative offices. The content of education on mass mobilization has been included in political education, specialized meetings, and party meetings, etc. Therefore, the awareness of cadres, staff, and workers on the purposes and requirements of the task of mass mobilization and their observance to the law, the Army regulations, and the mass mobilization regulations have been improved. Due to the fact that Group operates in different places throughout the country, including remote areas and border regions where a majority of people belong to ethnic minorities and where the hostile forces often carry out their illegal activities, besides enhanced production, the Group’s Party committee and the Board of Directors have attached importance to direction over the work of propaganda, aiming at raising awareness of the people towards the Party and State guidelines and policies. Combining different methods which are relevant to the people’s level of knowledge and easy to understand, the Group has collaborated with local authorities to conduct propaganda and dissemination of law to the people. Therefore, the task of mass mobilization has recorded significant outcomes, making contribution to consolidating people’s belief in the Party and State guidelines and policies, raising their awareness of the issues such as nationality, religion, and national sovereignty as well as the hostile forces’ plots and activities. The people have actively participated in maintaining social order and security, building safety areas, and contributing to Homeland protection in the new situation. Advocating that maintaining social order and security serve as an important content of mass mobilization, making contribution to the improvement of people’s material and spiritual life, the Group has regularly worked with the local party committees and authorities to firmly understand the people’s thought and demands, bringing into play the pioneering and creative role of organizations, such as the Youth Union, Women Union, and Trade Union in implementing movements and programs for social-economic development. In the past years, the Group has actively participated in the movements such as “the Army joins hand with the people to build new rural areas”, and “hunger eradication and poverty alleviation”. It has contributed by building bridges, rural roads, schools, and medical facilities, providing breeding cows, cooperating with Military hospital 175 to conduct health examination and provide medicines for people in the most difficult regions. As the result, a number of rural areas have gone significant changes in infrastructure, production development, and sustainable poverty alleviation. The people’s material and spiritual life has been improved. Upholding the spirit of “the good leaves protect the tattered ones”, the Group has opportunely assisted people who suffered from natural disasters such as drought, flood, and salt intrusion in the Central and Mekong River Delta regions. It has also contributed dozen of billions to the program for building 1,500 gratitude and comradeship houses launched by the MND. Since 2007, the Group has built more than 200 gratitude and comradeship houses for revolutionary families in Hanoi, Ho Chi Minh City, Tay Ninh, An Giang, Long An, Ben Tre, Phu Yen, Lam Dong and Kon Tum provinces. 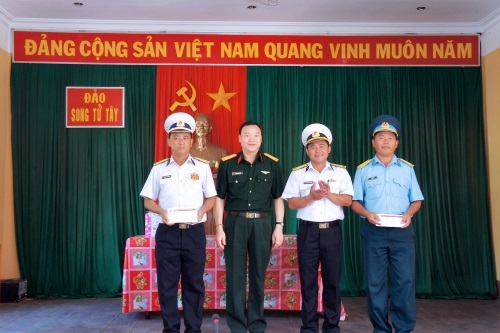 Upholding the spirit of “Remembering the source when drinking water”, the Group has actively supported funds for taking care of people in difficulties, whole-life taking care of 5 Vietnamese Heroic Mothers in Cu Chi district, Ho Chi Minh City, etc. In addition, the Group has also cooperated with localities to upgrade and renovate structures of historical and cultural values. The efforts of the Group have made contribution to consolidating people’s belief in the Party and State guidelines and policies, improving a firm “people’s hearts and minds posture”. In the process of implementing social policies, the Group has always encouraged and created favorable conditions for its companies and units to bring into play their advantages. For example, in the past years, Thai Son Vocational Training Center has given priorities to the beneficiaries, discharged soldiers and officers, as well as the children of war invalids, etc. On undergoing projects, the Group’s units are making their utmost, day and night, 7 days/week to help build inter-commune roads, sport facilities, and irrigation canals. Their practical efforts have made contribution to upholding the image of “Uncle Ho’s soldiers” in the field of production and economic development. In addition, the Party Committee and the Board of Directors have paid attention to improving cadres, staff, and workers’ income, taking care of their family conditions, providing housing and supporting families in difficulties, providing health care for workers, and encouraging the workers’ children to study. As a result, cadres, staff, and workers of the Group are satisfied with their jobs and manage to successfully fulfill all their assigned tasks. With the above-mentioned outcomes, the Group has repeatedly been awarded the title “the Unit of good mass mobilization”, and highly appreciated by local authorities, party committees, agencies, and the people. In the time to come, the Group will continue to closely combine production development and doing business with mass mobilization in line with the Party and State guidelines and policies, as well as the MND’s direction, making contribution to the consolidation of military and defence potential, meeting the demands and tasks of Homeland construction and protection in the new situation.